The Temperance Movement cannot be pinned down. They don’t want to be – after all, who likes labels? 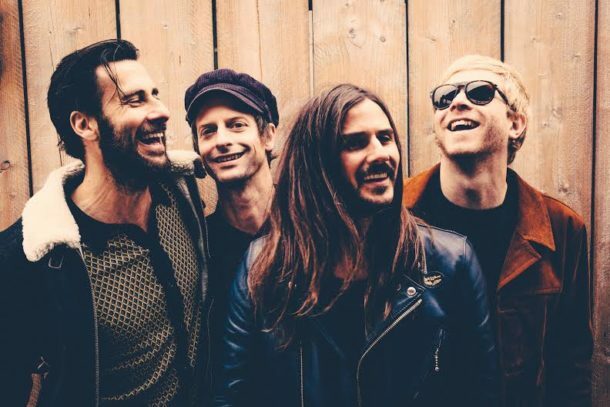 But the real reason the Temperance Movement is not simply a rock group of the blues, Southern or jam band variety is because their music resists the boundaries set by those labels. The band’s second album White Bear (set for release in the United States on July 15) has many different sounds and styles. Layered rhythms blur into a rollicking Wild West ride on “Oh Lorraine,” the guitar opening in “A Pleasant Peace I Feel” has a “Dear Prudence” quality reminiscent of the White Album-era Beatles, and the title track is as exploratory as the entire album in terms of speed and style, with an underlying psychological message to boot. Drummer Damon Wilson handles the band’s rhythm alongside bassist Nick Fyffe, a task that demands precision, creativity and occasional improvisation. Calling in from a children’s park in London where his son was playing after school, Wilson spoke with Blues Rock Review about White Bear – what the title means, the importance of touring in the U.S. and the pros and cons of assigning labels. If we say the Temperance Movement belongs to a specific genre, listeners’ interpretations of their music may be compromised. Genre suggestion is about as strong as the idea behind White Bear: now that an image of the animal is in your mind, can you forget it? White Bear was released earlier this year in the UK. Are you excited for its U.S. release? One hundred percent. We started this band so that we could visit America. All of our favorite bands are American. This was the dream for us, to release music and visit people in the States. Even though this is album number two, it’s just as exciting as the first one we released out there. It’s a bit of a strange one, releasing a record in one territory and then months later releasing somewhere else, but America feels like its own thing. It’s a special place for us. I imagine releasing in separate places at different times helps an album gain momentum. Yeah. I think it also allows you to release, hang out in an area, work hard in that place and then move on and do it again. Not be stretched too thin. We’ve been playing out in Europe and the UK, so it’s nice to know that now’s our time to concentrate on being in America. Can you tell me about the recording process for White Bear? I heard that the first album was recorded in four days. Is that right? How long did the band take to record White Bear? About 10 days. We spoiled ourselves this time. We’re a live band, so it’s always going to work best for us if we get somewhere, set up and play together. Having said that, with this record we wanted to have a little more time to experiment a bit with sounds, where we placed ourselves in the room, where we placed amplifiers and the instruments we chose. We didn’t just want to play a live set and record it. We wanted to hone in a bit more. But the recording process was pretty similar. We worked with Sam Miller, who recorded and co-produced the first record, and it’s just a joy. He’s an old friend and we don’t need to talk too much about stuff; we just kind of intuitively know what the other one’s looking for. It just falls into place. We recorded in three different studios. We went back to the first album’s studio, the Fish Factory, which is a real DIY studio in North West London. It’s got the control room up high and you walk down a set of stairs into the recording room. We did probably four, five songs there, then we moved to a studio called Rockfield out in Monmouth in Wales, which is a real famous studio. Queen recorded a lot there; I think the first Coldplay record was recorded there. Hundreds and hundreds of great records have been recorded there since the sixties. Then we have a friend who owns a studio in Oxfordshire. We thought maybe we had the record. There are a couple of people that we know and trust that we played the 12 songs that we had, and they said, “Look, it’s great. Could you do more? Could you push yourselves more?” So we listened to that, and we went to this studio in Oxfordshire and came up with some of my favorite songs on the record. “Oh Lorraine,” “I Hope I’m Not Losing My Mind.” So that was great. I wanted to ask you about “Oh Lorraine.” The rhythms are so layered and complex. “Oh Lorraine” and “Modern Massacre” were two of the last songs we recorded. “Lorraine” is a funny one. “Lorraine” we really went ‘round the house, which is rare for us. Usually when there’s an idea and a couple people are on board with it, it finishes itself pretty quickly. That one kind of finished itself, and then we started again. We kept going around and then we put it to one side for a good couple of months. Then when we got in the studio that last time, we were listening to different styles: we were listening to Tame Impala and some early Beastie Boys, Check Your Head and Paul’s Boutique. I think we just wanted to try some stuff and not make it a straight-ahead, tight track. Is there a story behind the album’s title? Yeah, there’s definitely a story. Nick, our bass player, was reading about an experiment that was done, I think in the seventies, by a team of psychologists. They were interested in the concepts of ridding yourself of unwanted thoughts and, if you try not to think of a white bear, then that’s all you’ll think about. I think [Nick] mentioned it to Phil, and Phil was like, “Yeah, I love that idea,” as kind of a broad concept for the whole record. The idea of staying focused, of staying mentally clear and plain, and how hard that is. One thing we’ve been lucky about is that we’ve been able to really focus on something together. It’s just rare to find yourself in a group of people and focus hard with a singular energy. So that white bear idea really clicked. It’s definitely not a polar bear, either. It’s a bear that just happens to be white. That’s the other thing – I think we struggle with getting across to people that we’re not a band that wants to be easily labeled. We like the idea of a little ambiguity. That’s why there’s never a picture of the band on our album covers. We don’t feel like we’re a classic rock band or a Southern rock band or a British blues revivalist band. We’re just a band. The songs on the album are so diverse. It’s hard to pigeonhole the Temperance Movement into one genre. Yeah. And that can be a blessing and a curse, you know. As humans, we love to be able to put labels on stuff. There’s nothing really wrong with labels. Labels can be great. I’m a journalist; I’m an Australian; I’m a drummer. Whatever works for you, helps you focus on what someone or something is. But I guess the thing with labels is that you set an expectation, don’t you? People expect you to sing, play or behave a certain way. We have no idea how we want to play. When we step onto a stage, our one goal is to try to push each other to something new. We have no idea what the next record’s going to be like. It would be dangerous for us to say, “Yeah, we’re a Southern rock ‘n roll blues combo.” It’s also more fun, isn’t it? When you can’t put your finger on something? It makes the music a little more challenging to listen to, in a good way. You have to listen with open ears. I think that also leaves some room for the listener to be an artist. I like the idea of just going, “Well, you know, I’ll let you decide.” We don’t want to lead people the whole way. We want people to be creative in their own way. The great thing about living in the time we live in is that you can answer to anything at any time. Sometimes, that’s not a brilliant thing. I kind of miss the days where you’d be talking with someone about a movie and you’d be arguing about the name of an actor. In the old days, you’d just go, “Yeah, well I think this,” and your friend would go, “Well I think this,” and you wouldn’t know. But now, as soon as the question’s on, “Well I’ll just Google it,” and there’s the answer. The conversation’s over, it’s all over too quick. It takes the guesswork out of it. What were the Temperance Movement’s initial goals as a band? How have those goals changed over time? We had very few goals. We wanted to be the new Black Crowes, but we didn’t really think that anyone else would be particularly interested in our band. That didn’t really bother us. Everyone was making music in different forms, in studios and on tour. Since then, our goals have presented themselves to us. We would do a show, and then at the end of a show we’d say, “This stage isn’t big enough for us.” And we’d do another show, and then we’d go, “You know what? Next time we come back, our goal is to headline the show.” I think the challenges or the goals have really presented themselves to us. Our next goal is to go to America regularly and play. What in your mind makes a great gig? Something unexpected happening. That’s a great gig. A mistake. Someone starting something differently and then the rest of us reacting differently. Our fans come to a lot of shows, they’ll come to multiple shows on a tour, and we’re not that band that plays to a click track with a defined, one-hour, 42-minute, 37-second show. There’s no specific agenda other than coming up with something fresh. It’s not like we’re playing avant-garde jazz, but we definitely want to challenge ourselves. I think that’s the best, when something unexpected happens and it somehow comes off. Do any of those unexpected happenings develop into songs? I don’t know if they have. That’s a good question. I know that White Bear, a lot of it was written in jams at sound checks on our European tour in 2013. That was the jumping off point. Unexpected things happened there, and those jams formed the sound of the record because we would be playing on a stage with a big empty room, and that shaped the sound of what we were doing. It was a bigger sound straightaway, before we’d even recorded anything. Can you recall a musical memory that stands out as being important or impactful to you or your career? I think a real favorite one for me, and there have been lots with this band…but very early on in the band’s career we were asked to play the Royal Albert Hall as part of a charity night. There was a bunch of people there: the guys from Deep Purple played, John Paul Jones played, a whole lot of people played. It was a bit of a who’s-who backstage – and us. We went on maybe third, and we had a really great set. No one had heard of us, and I think it did a lot to move the band forward. It got us in front of a lot of people. We came off and we were sweating, we just looked at each other and nobody said anything. We walked back to the dressing room, and as I was walking down the corridor, John Paul Jones started walking toward us. Led Zeppelin’s the first band that I really heard about from my older brother and understood was a band. Up until then, music was in the distance for me. But being about nine years old and hearing Led Zeppelin, and hearing everyone in that band separately – you could really hear them, the four individuals. Then to come offstage and have John Paul Jones walk by…I kind of took it as an omen. I don’t normally do this, but I just said, “Your band is the reason that I play music today, and I can’t thank you enough for that.” He looked at me, and he’s got a pretty wicked sense of humor. He said, “Well, that’s wonderful. How’s that working out for you?” I said, “You know what? It’s working out pretty damn well.” He said, “Well, that’s wonderful. Anyway, got to go and play.” And he went onstage. But the important part was that connection that we had, our first proper big gig. It felt like the beginning of something. 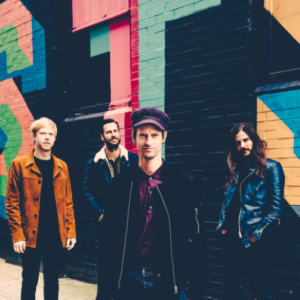 What’s next for the Temperance Movement? We’re doing a lot of listening at the moment. We’re trying to challenge ourselves with what we’re listening to, what we’re reading and what we’re watching, to try and start something special and unique in ourselves. We’ve got a lot of touring coming up, but I think maybe in November we’ll find some time to sit down and write. Maybe a record will come, maybe it won’t. We’re not in any rush. We feel like we’ve still got to make album four and five and six and seven after that, so there’s not an overwhelming pressure on ourselves. We just want to make good art and hopefully connect with people through it. We had such a fantastic time last year. We had so many good times and so many out-of-body experiences: things like playing Jazz Fest in New Orleans and playing the blues in Chicago, having people in Chicago dance and nod their heads. So many incredible moments of being where the blues came from and connecting. We really can’t wait for people to soak up White Bear.